Introduction: Used to control axillary bud (sucker) growth after the floral portion of tobacco plants have been topped. 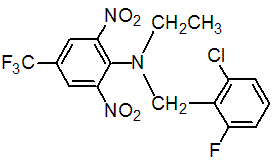 Another name: Flumetraline, Prime+, Flumetalin, Premier, etc. Acute toxicity: 1) Acute oral LD50 for rat: >5000 a.i.mg/kg. 2) Acute dermal LD50 for rat: >2000 a.i.mg/kg. 3) Inhalation LC50 (4 h) for rat: >2.41 a.i.mg/L. 4) Moderate skin irritant (rabbits). 5) Extreme eye irritant (rabbits). 6) Skin Sensitization: Sensitizing (guinea pigs). NOEL: (2 y) for rats and mice is 300 ppm. Effect on birds: low toxicity to birds, acute oral LD50 for Japanese quail is >2000 a.i.mg/kg. Effect on fish: high toxicity to fish, acute 96 hour LC50 for Bluegill sunfish is 0.023 a.i.mg/L. Effect on aquatic invertebrates: moderate toxicity to aquatic invertebrates, acute 48 hour EC50 for Daphnia magna is >0.160 a.i.mg/L. Effect on algae: moderate toxicity to algae, acute 72 hour EC50 for Pseudokirchneriella subcapitata is 0.85 a.i.mg/L. Effect on earthworms: moderate toxicity to earthworms, acute 14 day LC50 for Eisenia foetida is >500 a.i.mg/kg. Animals: Metabolic reactions include reduction of the nitro groups, acetylation of the amino groups and hydroxylation of the phenyl ring. Plants: Metabolism in tobacco is rapid and extensive; reduction or complete removal of substituents occurs. Soil/Environment: Strongly adsorbed and therefore immobile in soil; degradation is by photolysis. Stable to hydrolysis at pH 5, 7 and 9. Usage: Plant growth regulator reported by M. Wilcox et al. (Proc. Plant Growth Regul. Working Group, 1977, 4, 194). Introduced by Ciba-Geigy AG (now Syngenta AG) and first marketed in 1983. Patents: BE 891327; GB 1531260. Manufacturers: Milenia; Syngenta; Zhejiang. Has local systemic effect, contact action, phytotoxic. Application: Plant growth regulator, which has a local systemic effect. Control of sucker growth in tobacco, applied at 10-15 ml of 1-35% solution per plant. May cause some injury to immature plants.